Ever the publicity hound, Sen. Chuck Schumer, who obviously has no idea what additive manufacturing actually is, came out big and strong against “stomach-churning” 3D printed plastic guns last week. This naive, sensationalist rant so misunderstands the issue, I almost don’t know where to start. He goes on to inform the public that because these guns are made of plastic, they are undetectable, so he must introduce legislation that will make it illegal to possess an undetectable or an untraceable weapon. This is like putting a “Band-Aid on a heart attack.” Sen. Schumer simply doesn’t understand what he is dealing with. In fact, most of us don’t. We (all of us) need to understand how different the actual world is from the world most of us think we’re living in. Most people believe that tomorrow is going to be substantially identical to today. The sun will rise, you’ll have breakfast, go to work, etc. But, those are the things we try to keep constant in our lives … technological advances don’t work that way. Technology is evolving at an accelerating rate and we really have no chance of keeping up with it – not legally, not legislatively, not socially, not strategically … not at all. The best we can do is position ourselves to quickly adapt to change – it is the only guaranteed part of our reality. 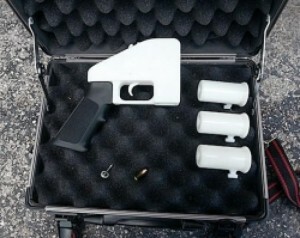 Back to 3D printing, aka additive manufacturing — 3D printed plastic handguns are just one example of an unimaginably large number of weapons one could manufacture using a 3D printer. They are also an example (by manufacturing technique only) of the infinite number of constructive, uplifting, world-changing, life-affirming, life-saving items that one can manufacture using the exact same technology. There are several variations of additive manufacturing technology. 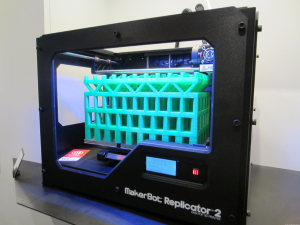 The 3D printer that has everyone’s attention prints one layer of plastic at a time. The thickness of the each layer determines the printer’s resolution. Thinner layers allow for more complicated and intricate output. Resolution of the printer is also a function of the materials being used to create the output. Some materials require thicker layers to print stable objects, other materials can be printed on nano-tech scales. The plastic guns in question are easy to print on inexpensive 3D printers because they are basically simple blocks of plastic with grooves and a few holes in them. Now that you know what a 3D printer is, you must also understand that 3D printers are not limited to printing in plastic. There are 3D printers that print in wood (a mixture of wood particles and binding agent that dries as wood) ceramic, carbon fiber, bronze, iron, steel, cellulose, human tissue (certain body parts for human transplant are grown using 3D printed frameworks) … there are limitations to the range of additive manufacturing materials, but the technology is evolving rapidly. As for guns … CAD/CAM files (the computer files that 3D printers transform into physical objects one layer at a time) for the .45 caliber M1911 or the 1911A-1 single-action, semi-automatic pistol have been online for years. In fact, you can find all kinds of CAD/CAMs for all kinds of gun parts, bomb parts, bazooka parts, rocket launcher parts and other deadly weapons online. These are computer files, like songs or movies or documents or images, they cannot be protected or digitally rights managed (DRM) any better than the entertainment industry has done with its intellectual property. A file is a file is a file, if someone wants to copy it – it will be copied. You can’t tell what the file contains unless you open it and, most importantly, there is no way to ban or prohibit the transfer of files. In this case, the genie is out of the bottle, you can’t put the toothpaste back in the tube, the ship has sailed – the files are out there. Plastic guns? Seriously. How about guns printed in steel, guns printed in carbon fiber, guns printed in, you name it – there’s a 3D printer that can print in the medium. In a world of 3D printers, there is no such thing as gun control – people who are so inclined will print all the guns and ammo they need – untraceable, no serial numbers, no markings about point of origin, no trade marks, nothing! That’s the dark side of this technology. However, the benefits of 3D printing are overwhelmingly positive. This is a picture of a 3D printed replacement part for a baby stroller. It was printed at a 3D printing bureau called Shapeways. 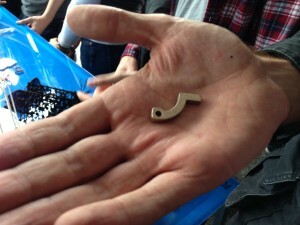 You can think of Shapeways as a Kinkos for 3D printing. Shapeways prints in all kinds of materials, including stainless steel. One of the employees of Shapeways needed a replacement part for his kid’s stroller, so he emailed the manufacturer and they emailed him a CAD/CAM file for the part. He printed two of them in stainless steel – one for the stroller and one to display at the Maker Faire, where I took this picture. This stainless steel part was annealed, deburred in a tub of ceramic balls and looks exactly like the spare part the manufacturer would have sent him. The difference is profound. The replacement part was printed on demand. The spare part would have to have been manufactured in advance, stored on a shelf, picked, packed and shipped. Rent would have been paid on the real estate the physical spare part occupied and it would have to be kept in stock during the entire useful life of the particular stroller design. Go have a look at an average manufacturing facility and see how much real estate and other resources are used storing parts that may break sometime in the future. Now multiply this by everything ever made in a factory and you start to see the kind of economic impact 3D printing may have. How about 3D printers in sterile environments (like Hospitals) creating specialized instruments for surgery (robotic or other)? Let your imagination run wild – once you understand additive manufacturing, you will think of thousands of ways to use this technology – you will also realize how it is going to change supply chains and shipping and real estate and materials handling and on and on. 3D printing is changing the world. Now Sen. Schumer, let’s start over. This is not a technology to sensationalize. When high-speed laser printers became economical for people to have at home, they did not start printing counterfeit books – but the nature of printed material changed forever. That is exactly what is going to happen here. Some things will be 3D printed, others will not. Some things will be cheaper or better 3D printed at home, others will be better 3D printed by companies like Shapeways, and still others will be printed in factories because it is more cost-effective to do so. From now on, physical goods can easily be produced from the files that were created to design them – which gives a whole to meaning to “Real 3D” and gives us a science fact version of Star Trek’s Transtater (sans Transporter and Warp Drive).